This ominous use of a martial Rama in a public rally brings another time, and another Rama, to mind. After the demolition of the Babri Masjid in 1992, several writers were invited to speak to school children about what had happened. Many teachers told us that their students were puzzled and disturbed by what they had heard on television, in their homes and their neighbourhood. In response, Shama Futehally and I got together with other writers to retell, for children, what we called “the jigsaw puzzle that is India”. I decided to write a story about the many Ramas we know. The Hindutva brigade sees only some faces of Rama. They only talk about Rama as a god they have exclusive access to, or as a warrior bearing weapons, or as a stern husband or king laying down the rules. In effect, they miss out on the many dimensions, the richness, of the men and women who people our epics. Remembering a story of Rama as, above all, a compassionate man, I decided that this was the face we needed to see once more, so we could insist that no one’s story is complete. Nor does it have a monopoly. Our cultural legacies have meaning for us only if we tell and re-tell multiple stories of heroic figures, whether mythical, legendary or historical. Rishab pushed open the door of his house and ran in. His bag flew from his back on to a nail on the wall. “First time!” he shouted gleefully. He had been practising for months, and now the bag had flown to its right place almost on its own, as if it had a pair of wings. “Is that you, Rishab?” called his grandmother, coming in from the kitchen. Rishab grinned to himself. His grandmother asked this question every single day. The running footsteps and the bag’s slap against the wall told her who it was, but still their afternoons together always began with this question. Later, after they had eaten and she had washed the dishes, they lay down side by side. Sometimes, when Rishab thought about which part of the day he liked best, he found it difficult to make up his mind. He loved the early morning when he woke up to the sound of his grandmother singing under her breath, as she picked flowers in the muddy little patch behind the house. Or the evening, when his mother got home from work, then his father. But the afternoons were, he decided, the most peaceful. His grandmother and he would lie side by side, the sun streaming in through the window into the quiet room. Or she would tell him stories, stories different from the kind he read, or heard in school. Some days, she would sing him one of the hundreds and hundreds of songs she knew. She had a soft, trembling voice, but she knew what every word meant. Rishab could tell, from the way she sang, that she believed in the song. He could see how much she loved it. Sometimes she would sing a story-song; a story from the Ramayana or the Mahabharata. Then one day, Rishab came home later than usual. His grandmother stood at the door, waiting for him. He went in with her, so full of news that he forgot to make his bag fly on to the nail on the wall. “Oh? What procession was that?” she asked him, taking the bag off his back. Rishab was so full of the crowds he had seen – the colour, the noise and the marching that had reminded him of an army – that he didn’t notice how silent his grandmother was. Grandmother didn’t even look at it. “Put it away and come to eat,” she said. Rishab was so excited by what he had seen that he had forgotten how hungry he was. “Sita admired the tail very much. She thought she would like to take home a tail like that to remember her years in the forest. 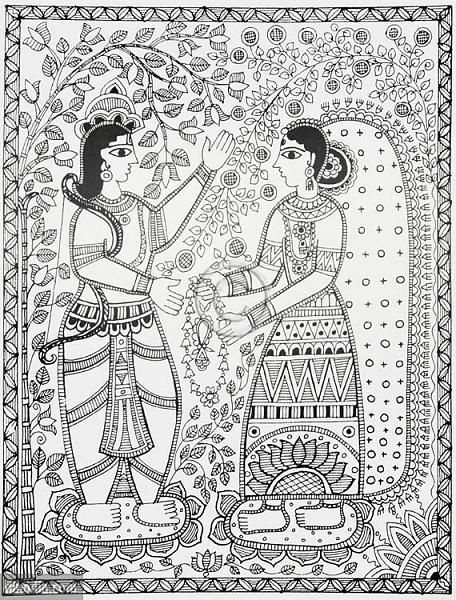 “Rama decided to get the deer’s tail for Sita. “But the deer suddenly turned around. Now Rama could no longer see the tail. Instead, he saw the deer’s large, trusting eyes, and its defenceless neck – stretched out as if it was offering it in place of its tail. Rishab looked at her, a little puzzled by Grandmother’s earnest face. “Do you remember what I called the song I sang yesterday?” she asked him. “Do you remember what that means?” she then asked. “A prayer that is love,” he replied. And Rishab remembered the song again. He saw a peaceful, loving, generous face, like Rama’s when he spared the deer. This was the face of Rama that he saw in his head whenever he heard Pati sing. Then they fell asleep together, side by side, as if they had travelled a long distance that afternoon. Read the Hindi translation by C.D. Tiwari and Shama Futehally in the Hindi edition of the book here. Reproduced from Sorry, Best Friend!, eds. Githa Hariharan and Shama Futehally, Tulika, 1997. Reproduced with permission from the author. Githa Hariharan (githahariharan.com) is the author of novels, short stories, essays, newspaper articles, and columns.